Still on cloud 9 after my trip last month, I’m finally getting around to editing the photos and video clips from Helsinki. This was my first trip to Finland, but also Scandinavia, so as you can imagine there’s a ton of content to cull. I have many travel recos coming soon in another post, but I wanted to first share this outfit which was perfect for both sightseeing and going out. A summer to fall transitional outfit, if you will. 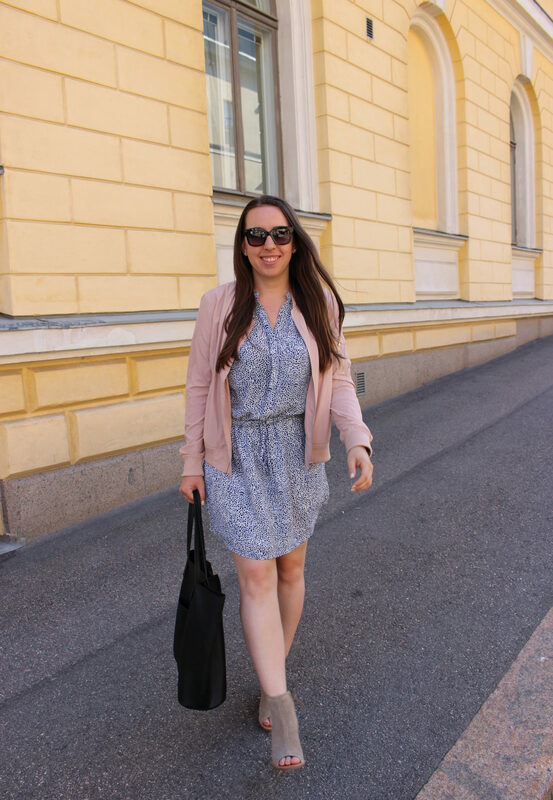 I picked up this comfortable drawstring dress from TJMaxx to be one of the key printed pieces in my travel capsule wardrobe, as I packed mostly neutral shoes, jackets, and accessories that would work with everything. Like San Francisco, Helsinki would get pretty breezy in the evening, so I wore this jacket nearly every day on the trip. Looking back at the photos now, this would be something I’d totally wear here at home. Like this look? Be sure to check out some of my other outfits or travel posts before you go. Thanks for reading! Such a cute outfit! I am loving those shoes. Love these sassy booties! Perfect for the transition to summer and fall! I love everything about this look, the jacket is amazing!